Many countries applied to participate in '32 Games, but the economics of the Great Depression prevented many national teams from traveling overseas. As a result, this four-nation hockey tournament would be the smallest field in Olympic history. Poland was the only nation to finish without a medal. An indoor and outdoor rink was used, which forced the players to keep adjusting from artificial to natural ice. It was decided that the four teams would compete in a double round-robin, meaning each team would face its opponents twice. 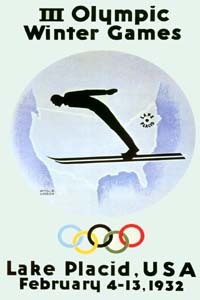 In addition to those 12 games, the IOC ruled that five exhibition games would be played on the days in which no official matches were scheduled. Among the participants in the exhibition games was Montreal's McGill University. Canada and the United States were evenly matched and well ahead of their European opponents. 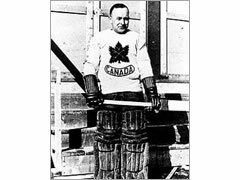 Overtime was required in the first meeting between the two rivals, with Canada's Victor Lindqvist providing the winning goal in a 2-1 victory. However the U.S. still had a chance at the gold medal when they met Canada on the final day of the tournament. Going into the game, Canada had a 5-0 record compared to the US's 4-1 mark. A win by the U.S. would force another game to be played to decide top spot. The hosts led 2-1 after two periods, but Canada, represented by the Winnipeg Hockey Club, forced the game into overtime on a third-period goal by left winger Romeo Rivers. After three 10-minute overtime periods it was still 2-2 and Canada captured the gold medal. Interest was such that 7,000 fans jammed a rink containing only 3,000 seats.